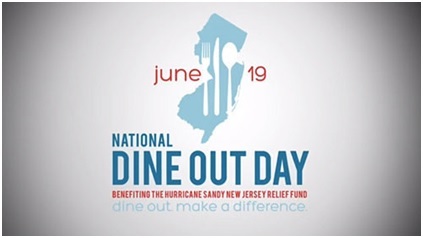 Today is National Dine Out Day, a day dedicated to Hurricane Sandy Relief in New Jersey. Across the country, restaurants are donating a percentage of today’s sales to the Hurricane Sandy New Jersey Relief Fund, which supports recovery and rebuilding efforts in communities that have been impacted by the storm. Homes, businesses, attractions and more were washed away by the storm, leaving countless people still feeling the sting of this disaster today. How can you help? Simply dine out tonight at a participating restaurant, and a portion of your tab will be donated to relief efforts. Help make a difference in someone’s life today. Some of the participating restaurants include Benihana, Ra Sushi, Aunti Anne’s, Panera Bread, Firebirds and Haru, as well as many others. For more information, to donate to the cause, or to view the restaurant list to find a participating location near you, visit http://www.nationaldineoutday.com/.